Here at Ray Pest Control we believe excellence in work ethic and integrity sells itself. We are determined to provide the highest quality job for the most reasonable price. We employ skilled technicians that are certified by the state of North Carolina to ensure a high standard of service and customer satisfaction. From bed bug extermination to wildlife removal services, we are your one stop source for all pest problems. Whether it is a squirrel in the basement, bedbugs in the bedroom, ants on the counter, bats in the attic, mice in the crawlspace or termites eating the walls, we have you covered. 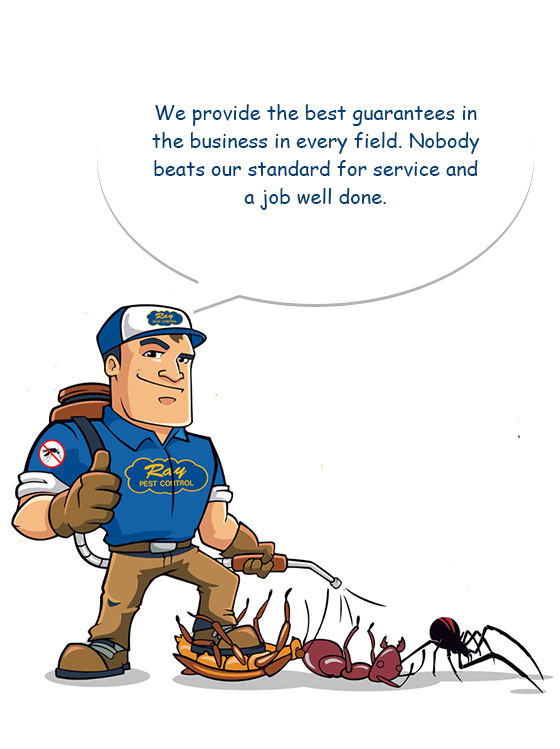 We provide the best guarantees in the pest control business in every field. Nobody beats our standard for service and a job well done. Ray Pest Control Co, Inc is a locally owned and operated pest management firm based in Winston-Salem, NC. We have been providing pest control, exterminator services to Winston Salem and surrounding areas since 1973. We have tenured pest control technicians who have been with the company for many years, including the 2008 technician of the year, on our staff who provide training to our newer staff and assistance to our customers. Our technicians are available to provide you service at the time you need it, when you need it. From bed bug extermination to wildlife removal services, we are your one stop source for all pest problems. We are proud to serve the entire Piedmont/Triad area with our high-quality and customer-oriented pest control services. If you have trouble with insect infestations, wildlife problems, termites, bed bugs or any other manner of pest problem, contact us today! We will provide you with a free quote and information about the best service options for your area and home. Your complete satisfaction with our services is our top priority as we are dedicated to keeping the residents of the Piedmont comfortable, safe and happy in their homes. Think of us as your neighbor—your neighbor who just happens to know how to safely remove and prevent every kind of pest problem that’s common to our area.